This print belongs to a series of twelve engravings; six of which show two male busts each, and the other six, female busts. It is common to find those prints cut in two and the set described as a series of twenty four prints. The original drawings are kept in Paris, in the Ecole nationale superieure des Beaux-Arts. The drawings and the prints used to be unanimously attributed to René Boyvin and Robert-Dumesnil even thought the prints were after Rosso Fiorentino. They are now attributed to Pierre Milan. The drawings have been attributed to Léonard Thiry, possibly using a model given by Rosso, and adapted for the engraving. This set is remarkable for Thiry’s success; it has been reproduced and copied many times. E. A. Carroll suggested that the masks were maybe not models for costumes as most people assumed but that they could be projects for 'pictures of masks out of colored stones, probably to decorate the walls or pavement of a room [...] at [the Palace of] Fontainebleau'. Print. Male bust in profile to the left: a masked man, with a curly beard, whiskers, and little horns on his forehead. He is wearing a necklace of pearls around a furry collar. His hair is entwined with grapes and vine leaves. 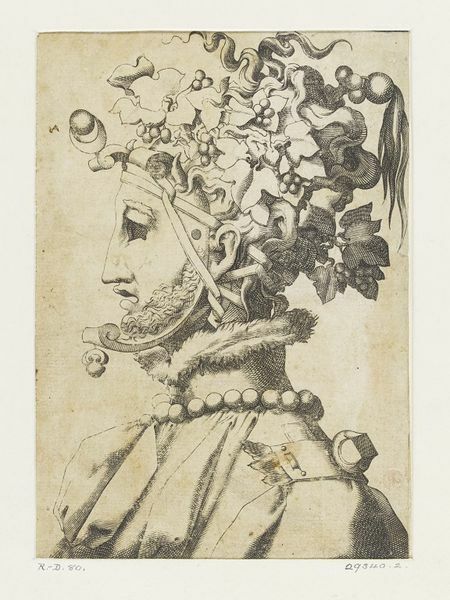 One of a series of twelve engravings showing a set of twenty-four male and female grotesque masks; ca. 1545-ca.1549. Attributed to Pierre Milan. Formerly attributed to René Boyvin. 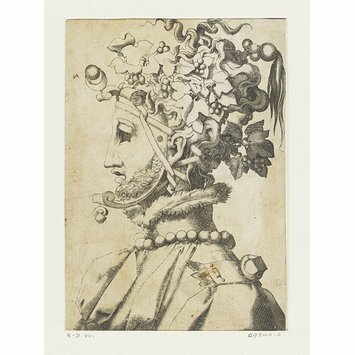 This print belongs to a series of twelve engravings; six of which show two male busts each, and the other six, female busts. It is common to find those prints cut in two and the set described as a series of twenty four prints. The original drawings are kept in Paris, in the Ecole nationale superieure des Beaux-Arts (Mas. 1296, Rec. 19). The drawings and the prints used to be unanimously attributed to René Boyvin and Robert-Dumesnil even thought the prints were after Rosso Fiorentino. But Yves Metman, using a 16th century document, proposed to give the prints to Pierre Milan and to set a terminus ante quem in 1559 ('Un graveur inconnu de l'Ecole de Fontainebleau: Pierre Milan', in Bibliothèque d'Humanisme et Renaissance, Notes et documents, I, 1941, pp. 202-214.). Emmanuelle Brugerolles attributed the drawings to Léonard Thiry (Le dessin en France au XVIe siècle: dessins et miniatures des collections de l'Ecole des Beaux-Arts, 1994, p. 108). She suggests that Thiry could have used a model given by Rosso, and adapted it for the engraving. This set is remarkable for his success; it has been reproduced and copied many times. E. A. Carroll suggested that those masks were maybe not models for costumes as most people assumed but that they could be projects for 'pictures of masks out of colored stones, probably to decorate the walls or pavement of a room [...] at Fontainebleau' (Rosso Fiorentino. Drawings, Prints, and Decorative Arts, Washington, National Gallery of Art, 1987, p. 215, footnote no. 3). Pierre Milan after Léonard Thiry. Plate from a series of twelve engravings showing a set of twenty-four male and female grotesque masks. France, 1545-1549. Robert-Dumesnil, A. P. F. Le peintre-graveur français, ou Catalogue raisonné des estampes gravées par les peintres et les dessinateurs de l'école française. Ouvrage faisant suite au Peintre-graveur de M. Bartsch. Par A.-P.-F. Robert-Dumesnil. Paris: G. Warée, 1835-71. Vol. VIII, no. 80. Metman, Yves. Un graveur inconnu de l'Ecole de Fontainebleau: Pierre Milan. In: Bibliothèque d'Humanisme et Renaissance, Notes et documents, I. 1941. pp. 202-214. Carroll, E. A. Rosso Fiorentino. Drawings, Prints, and Decorative Arts. 1987. p.215, footnote no. 3. Brugerolles. Le dessin en France au XVIe siecle: dessins et miniatures des collections de l'Ecole des Beaux-Arts. 1994. p. 108. Attributed to Pierre Milan. Formerly attributed to René Boyvin.